CodeIgniter (CI) is one of popular php framework. If you are already building PHP Application, CodeIgniter will help you to do it better and more easily. 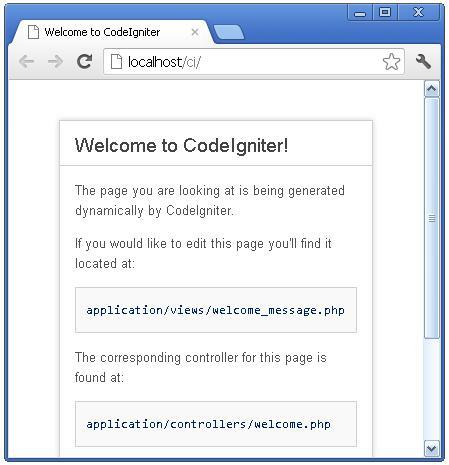 With CodeIgniter, you can save time, make your web more robust, your code will be easier to read and maintenance. It is free, lightweight, and simple to install. In this post, we will know more deep about CodeIgniter before write code. Nice, CodeIgniter is small and lightweight framework. You don’t need long time to download it. You can get it from http://www.codeigniter.com. CI was written by Rick Ellis, rock musician turned programmer. With CodeIgniter, you can cut down the amount of code you need to type. This is not just good for lazy, but: less type, fewer mistake, and less time for spend debugging. But, CodeIgniter is not everything. We will not find ‘engine generator’ that can build page self. Several frameworks have features like that. For example, they can create web page (that to do basic Create, Read, Update, and Delete operation) automatically. CodeIgniter doesn’t do this. This, I copy from their help page: “Our goal for CodeIgniter is maximum performance, capability, and flexibility in the smallest, lightest possible package. Loose Coupling. Coupling is the degree to which components of a system rely on each other. The fewer components depend on each other the more reusable and flexible the system becomes. Our goal was a very loosely coupled system. Nice feature, CodeIgniter is very flexible. We can apply at PHP 4.3.2 and above, or PHP 5.0 or above. CI support serveral database: MySQL, MySQLi, MS SQL, Postgre, Oracle, SQLite, and ODBC. Ok, now, we will learn how to install CodeIgniter. For this series i’ll be using the latest version of CodeIgniter at the time of writing; 2.10. 1. Head over to the CodeIgniter website http://codeigniter.com/ and download the source. 2. Extract the CodeIgniter files into an appropriate folder on your web server. if you want to work locally, use WAMP, MAMP or XAMPP. 3. Open your installation in a web browser and you should get the screen below. Now we will build controller and view better. Create parameters in controller and send it to view. It will make our application more flexible. 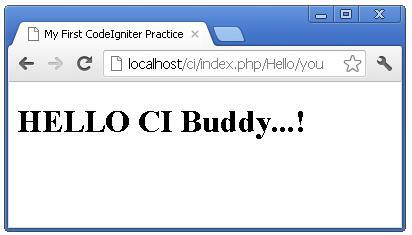 Point your browser to http://localhost/codeigniter/index.php/hello2/you. Now, we will learn how to get parameter from GET. As we know, we can see this parameter from Url. 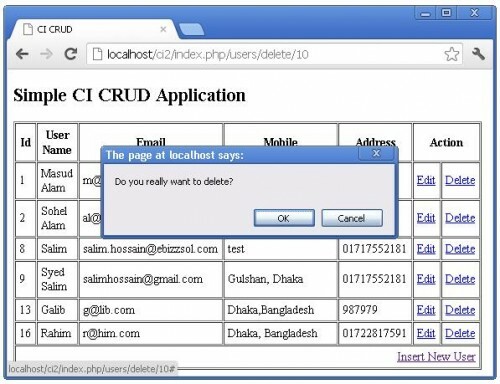 Example: http://localhost/index.php?name=Andi. Clear, we can get parameter name. How about in CodeIgniter? We will learn about showing data from database in CodeIgniter. But, before that, we prepare a database for practice. This post create a database named “ci_test” and a table named “users”. We use phpMyAdmin for easy. Enter database name “ci_test” in create new database field. Now, we learn how to show data in CodeIgniter. As we know, CodeIgniter use MVC pattern. We will use Model for retrieve data from database. Now, we will add links for insert, edit, and delete links for create our crud system. We use URL Helper to build the links. 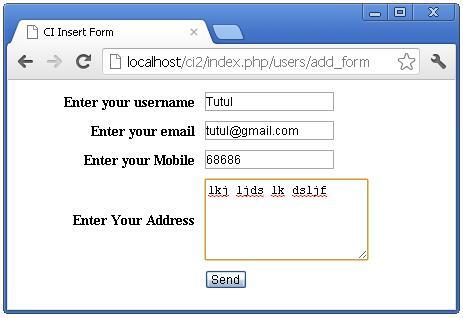 Now, we begin create a form for input data. Now, we need to load Insert Form. 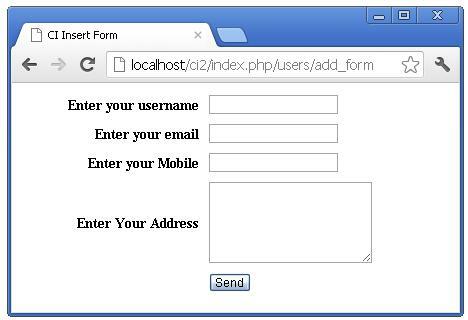 Put at controller (users.php within codeigniter/application/controllers), add_form () method. Ok. You can test it. Input some data to your insert form . After create edit form, now we add updating function. 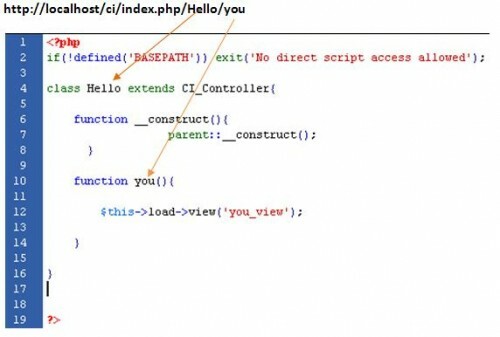 First, create update_info () method at model “users_model.php”. Now, we create deleting function. First, create a method delete_a_user() for deleting data at model. update view is missing. There is nowhere to edit user. Thank you very much for the rest! Thank you Masud vai, thanks lots, it helpful for me. I need your help. please let me know your email or cell number. i want to learn more from you. Thank you, very nice the tutorial! Edit view is not created.. So plz. Mausad bhaijaan or anybody else plz add it or else insert and delete are working well. Thanks bhaijaan, but, place the edit functionality inside it also place edit view code.. as soon as possible…. When trying to make the delete functionality in other page its not working…plz help me.. When trying to make the same delete functionality in other page its not working…plz help me..
You have no database called users. please make a database called user with the right table rows to make it work. I would like to put a very very special thanks for such a nice tutorial. Hope we can get more assistance from you by such a work….thank you once again. please provide me the full crud operation files please i need it.. Thank you,for your helpful tutorial.plz,give me the complete / run able insert,update and delete code. There is not edit code…. Thanks. Your post is very helpful. I think you type the wrong code.. Code in this example is absolutely correct.. watch you code . 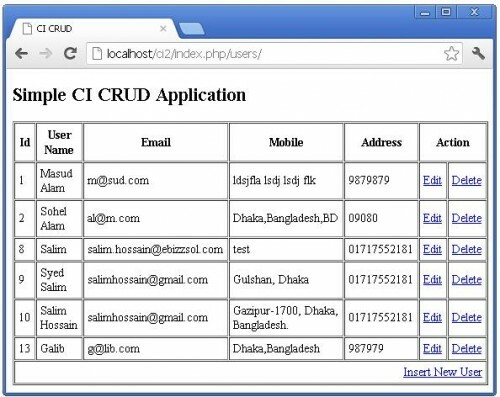 please send the entire code of crud ci app. hey,can u help me with the edit part. in the constructor of the Users_model do not put the name of the database in the brackets. Use config.php to define database. Thanks for nice and helpful tutorial of codeIgniter. In regard to “they can create web page (that to do basic Create, Read, Update, and Delete operation) automatically. CodeIgniter doesn’t do this.”, can you please name these platform, if possible, of course. Its really very good CRUD example.Really helpful for me. I’ve tried to add the database name in config file and make the () blank, but got some error said that no database was selected. Please some advice, I’ve tried to download your examples but it has been deleted. Bro download link given by you is not working. Its dead. Please update the download link. Great tutorial, but the download link is broken. Could you send me the file in e-mail? On “edit.php” there’s form action to guide to index.php/users/update, but no file with name “update” has been created at any point of the tutorial. I want to know the meaning of this line $id = $this->uri->segment(3); in this below function. why you have to use this. please tell me. Got it running on Apache/ Ubuntu. Works great though i had to massage a few lines of code!!! Thank you Sir!! It s working for me 🙂 I just made some small changes for edit.. It ll work.. I just made some changes for edit. I got the result. This is great tutoral! Thank you very much! at first in database config file,it will be database.php not config.php .Make sure it is right…. kidly help me in this. why does the code seems different from every site we visit. we want the short and applicable one.. 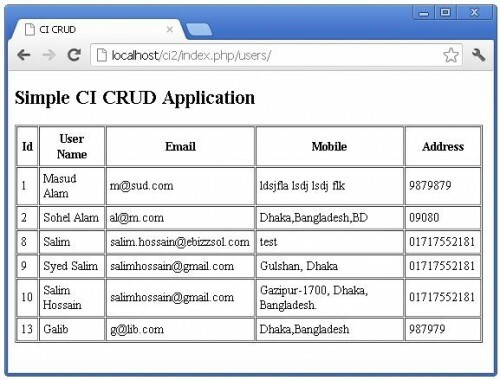 Thanks for sharing crud concept in very easy way. 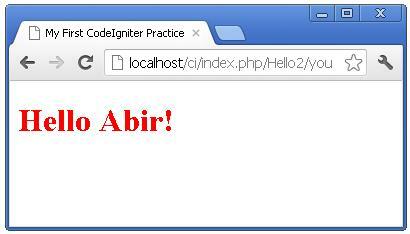 I m new in codeigniter php. It helps me a lot. New to PHP. I’ve just spent 2 hours trying to get the Edit function in the code to work. But I’m really happy because it forced me to look closer at the code and understand how it worked. Thank u very much for such a valuable post. insert, edit function is not working for me kindly help. I’ve tried to add the database name in config.file but got some error said that no database was selected. not a good practice to use index.php file in the url. overall, a good tutorial. can u send me the code, Here down load link is showing error. thanks for this it is very helpful for me..